Model 1449FA i features a 19 x 49.25 inch (483 x 1,251 mm) counter with an integral D-shaped lavatory bowl and back splash. The toilet is offset opposite of the lavatory. Fixture is arranged to be installed on finished wall through access panels. Panels are located on front and side of cabinet and are secured with tamper-resistant screws. WaterSenserecent advancements have allowed toilets to use 1.28 gallons (4.85 liters) per flush or less while still providing equal or superior performance. The WaterSense label is used on toilets that are independently certified to meet rigorous criteria for both performance and efficiency. Only water-saving toilets that complete the certification process can earn the WaterSense label. Must use optional HET valves to meet WaterSense label requirements. Please check with local ADA requirements. ADA complianceis subject to proper installation (including devices such as grab bars) and the interpretations of the local code authority. On Comby units, when used as an alternate to the deck mounted spout, this option allows the bubbler to be used for drinking. On lavatories, the -DMB option provides an ADA compliant bubbler when mounted near the front edge. The Power Fail Bypass Valve is a valve option that provides the control of an electronic valve but also works in the event of a power loss. This allows the fixture user to still obtain drinking water when power is lost and the Master-Trol® Plus controllers are not connected to emergency power. This option does not require any batteries that would need to be maintained and replaced periodically. It available on Combys and Lavatories. This single temperature valve is for use with the Time-Trol Valve Controller. The 24V solenoid valve features pushbutton activation and is provided with a stainless steel strainer and integral checkstop. Valve conforms with the lead free requirements of NSF61, Section 9, 1997 and ADA requirements. One push of the button initiates a programmed metering cycle; a second push during that cycle will stop the cycle. This hot and cold valve is for use with Time-Trol Valve Controllers. The 24V solenoid valve features pushbutton activation and is provided with a stainless steel strainer and integral checkstop. Valve conforms with the lead free requirements of NSF61, Section 9, 1997 and ADA requirements. One push of the button initiates a programmed metering cycle; a second push during that cycle will stop the cycle. 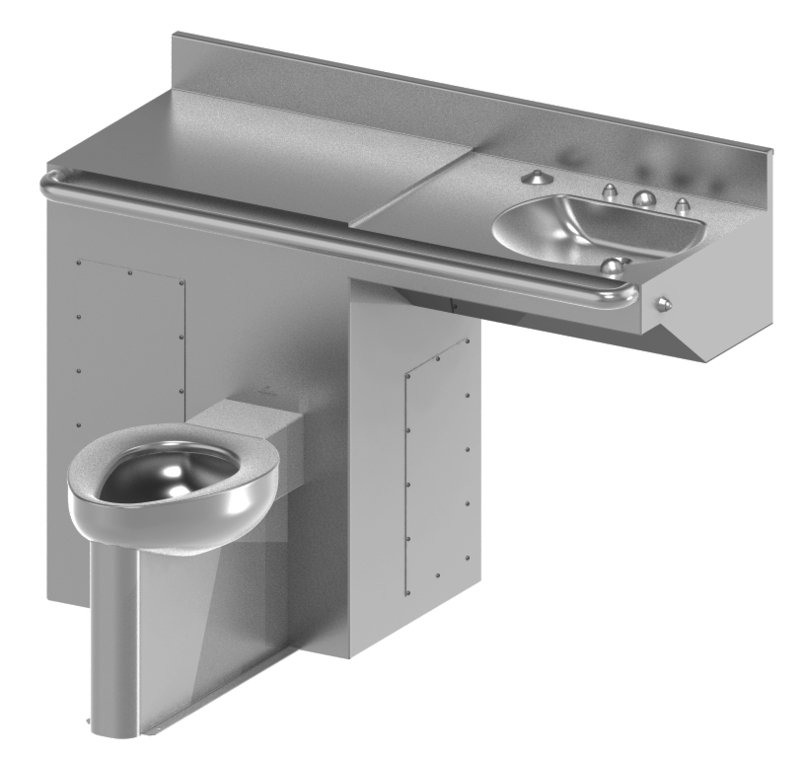 Model 1449 Comby features a 19 x 49.25 inch (483 x 1,251 mm) counter with an integral D-shaped lavatory bowl and back splash. The toilet is offset opposite of the lavatory. Fixture is arranged to be installed on finished wall and serviced from an accessible pipe chase.